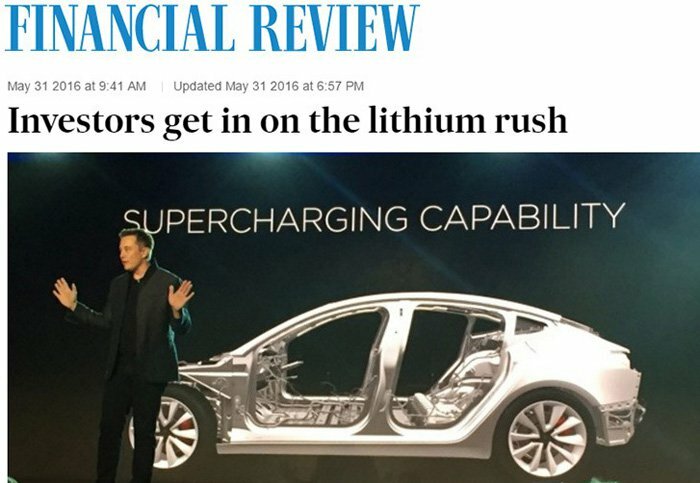 The current lithium boom has dawned on the ASX investment community. Lithium-ion batteries are sweeping across the world – being installed in mobile phones, laptops, electric cars and domestic energy storage solutions worldwide. Analyst estimates vary on the scale of the lithium boom but they do not vary on its validity. Lithium prices have started to rise and they’re taking ASX lithium stocks with it. The ASX company we are introducing today is flying somewhat under the radar in the current lithium rush. For the avid lithium followers, it’s worth noting that this company’s high grade exploration target trumps lithium heavyweights PLS, GXY, and AJM in the Li 2 O % grade department. Now, the pace of lithium consumption is largely dependent on how many lithium-ion batteries will be produced. The outlook is rather good considering that companies like Tesla, Nissan and Toyota have all earmarked huge production lines of electric cars over the next 5-10 years. Tesla’s Model 3 launch just last week proved that electric cars may have finally turned the corner in terms of being accepted as the best possible road transportation choice for consumers. If this proves to be the case, other manufacturers in tandem with Tesla, will be producing several million EV cars per year, and therefore creating a strong demand for high-grade lithium required as part of the manufacturing process. Several ASX companies are currently jostling for lithium resources, and bagging the best available projects in sight of the upcoming uptake of lithium from lithium-guzzling battery manufacturers. This trend has most definitely piqued our interest in all things lithium and it’s also why we’ve been on the lookout for strong lithium plays on the ASX in recent weeks. ...and is also strongly rooted in another metal that’s currently raising pulses: Gold. Gold is one of the world’s staple precious metals, a medium of exchange and a good resource to have in your basket if reaching out for other opportunities. This company has now 100% acquired a high grade lithium project, located within a few hundred kilometres from its gold operations. These two metals could potentially lead the entire commodities downturn out of the doldrums given their leading indicator status. 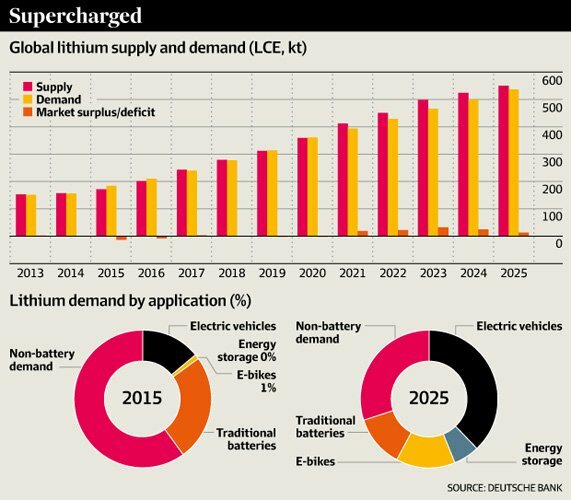 ...while lithium begins its move as a future staple commodity on the back of the energy storage revolution. This ASX junior is currently finalising a $3M, fully underwritten, rights issue to advance lithium exploration over the coming months – culminating in a Scoping Study by year end. Given the current economics forces in resources, this company may have the most complementary metals duet an explorer could have – which is cause enough for us to pull the trigger and begin our coverage. With a management team that has a history of aggressive exploration and development, Birimian Gold (ASX:BGS) will start its lithium drilling campaign in the coming weeks. If the ore body starts to look of size and nature to its much bigger lithium peers, it could be the last we see this stock at current levels. Due to previous work by the World Bank, metallurgical work is unusually advanced for an asset that has not been drilled. 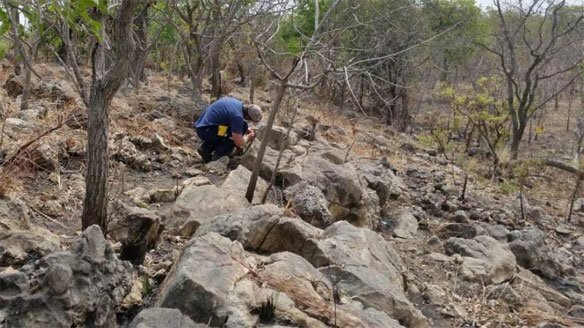 BGS will have teams in the field in the coming months, looking for potential repeat structures – this kind of field work has not been conducted on this ground before – so it could prove crucial for the company in its bid to shore up a lithium resource. Aside from established car manufacturers and the much talked about Tesla, even Apple is rumoured to be making an electric car . Tesla in particular, has led from the front in taking electric cars from peripheral novelty to prime-time staple for new car buyers. According to Tesla’s sales figures of 325,000 sales in 5 days; combustion engines are on the way out, while electric cars are the future of motor vehicles. Enter Birimian Gold (ASX:BGS), and its recently acquired high grade lithium project – with an exploration target of 17 Mt at 2.0% Li 2 O.
Whilst its early day for BGS’ exploration, we think the table below sums things up fairly clearly. BGS’ Mali lithium exploration target is of a size that puts in the ranks of much larger lithium players like GXY and NMT. When it comes to grade – the BGS target is much higher than what the other lithium explorers are seeing in the field. How long before BGS’s valuation starts creeping further upward? If we look further afield to see how the focus on lithium is affecting Aussie lithium companies, it’s clear that valuations are getting higher and higher. General Mining (ASX:GMM), with a market cap of $179 million, has seen its shares rise more than 1000% since it announced a plan in February 2015 to resume production at the previously shuttered Mt. Cattlin project. Pilbara Minerals (ASX:PLS) is now capped at over half a billion dollars. The company is accelerating development of its Pilgangoora project in Western Australia and forecasts production from about 2018. PLS’ share price has risen over 1400% since July 2014. Greenbushes, the world’s largest spodumene mine, is also located in Western Australia and owned by the Talison joint venture between China’s Chengdu Tianqi Industry Group and Albemarle Corp, the world’s biggest lithium producer. However at the same time, success is simply no guarantee – BGS is a high risk exploration stock – and caution is advised if considering as an investment. Let’s take a look at exactly where BGS’ projects are located, and what it has on its books. Now with all the focus on lithium, it should not be forgotten that BGS is also still a gold explorer. Chasing gold in Mali, BGS benefits from low-operating costs and has access to high gold grades given Western Africa’s geology. Whilst its gold projects are progressed in the background, BGS has taken the smart step of diversifying its project portfolio by adding a lithium asset located adjacent to its gold projects. As it stands, BGS has 3 gold projects and now a 100% owned lithium project under its control. This effectively means BGS can develop two rather different resources with hopefully the same eventual outcome: production. 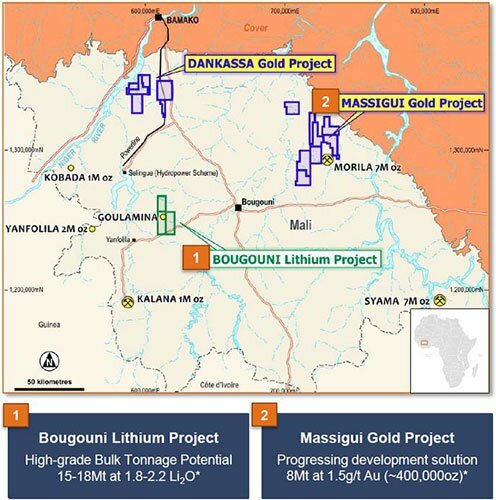 Here are its 3 gold projects mapped out, with Dankassa and Massigui in Mali, and Basawa in Liberia around 1000km to the south. Last but certainly not least is the Bougouni Lithium Project, located less than 200km away from its other Malian gold projects. The interproximal nature of its gold and lithium projects will help with keeping development costs low and make all three Malian projects just that little bit easier to manage logistically. 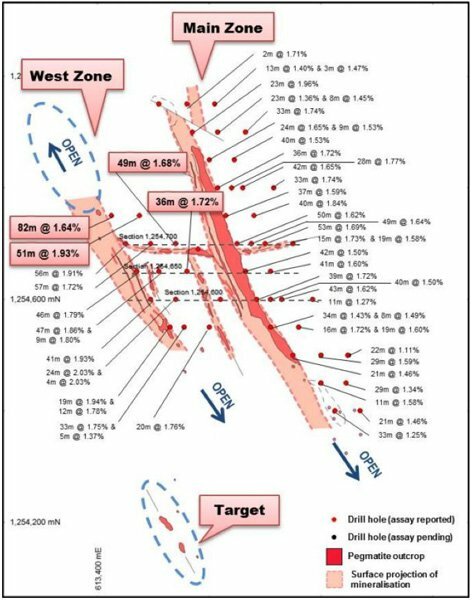 With its new fully owned lithium project now formally announced, BGS has immediately moved to initiate a maiden drill program at Bougouni as a priority. The tenure spans 257km 2 and has good infrastructure in the local area including road and power infrastructure. 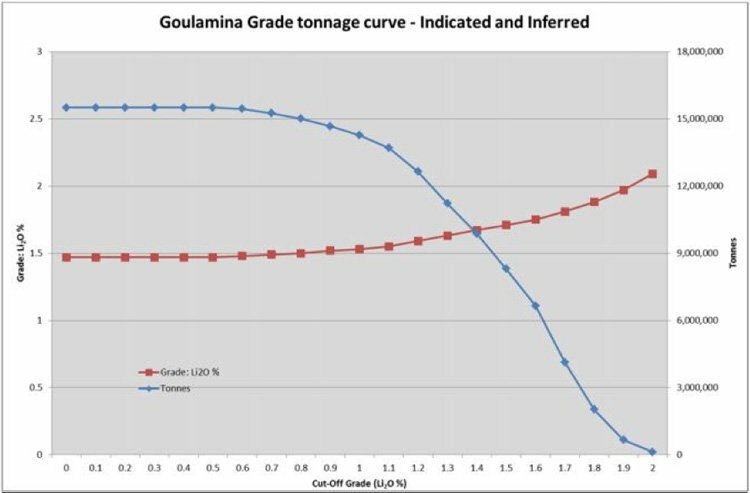 Bougouni has high-grade bulk tonnage potential around 15-18Mt @ 1.8-2.2Li 2 O estimated from previous field work conducted by the World Bank, including metallurgical test work, which is a good start. BGS says it expects to have a formal Resource Estimate and Scoping Study done by the end of this year which should flesh out exactly how much lithium BGS has in the ground. 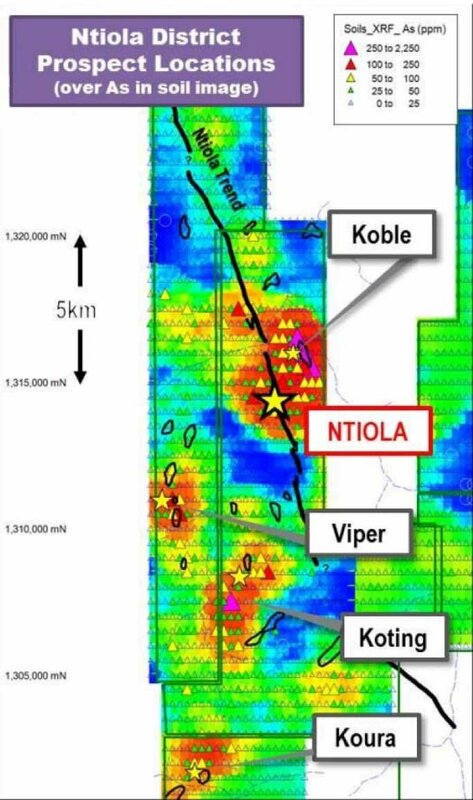 With an initial exploration target of 15-18Mt, that’s already a good place to start with further exploration hopefully adding to the overall Resource with potential on BGS’s tenements for repeat structures. Given the early stage nature of the Bougouni Project, the geometries of the ore body at depth are yet to be tested by drilling, however the World Bank completed significant test work on the asset. 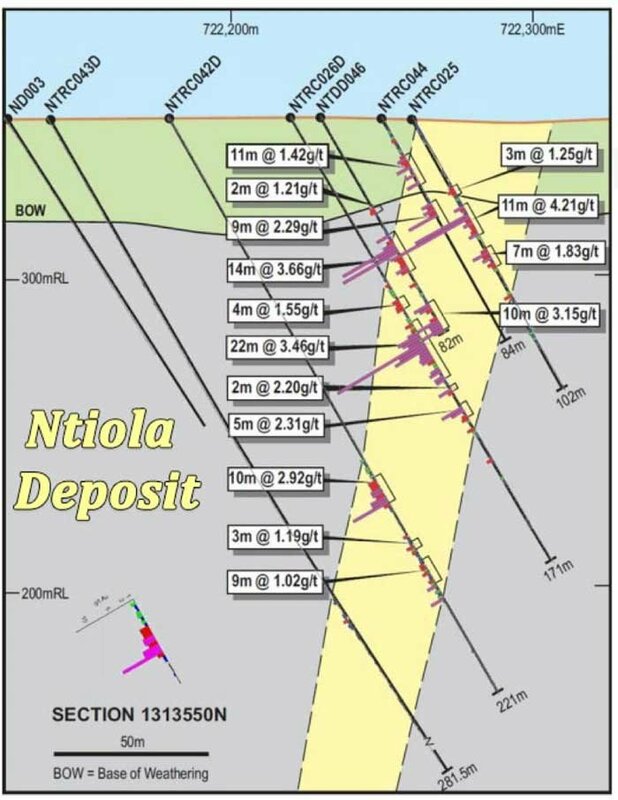 From the data library BGS acquired and has reported on so far, it’s clear that significant pegmatite outcrop extending over 700m of strike and up to 55m wide within one small part of its new tenements could be an early indicator of high-grade lithium deposits below the ground. 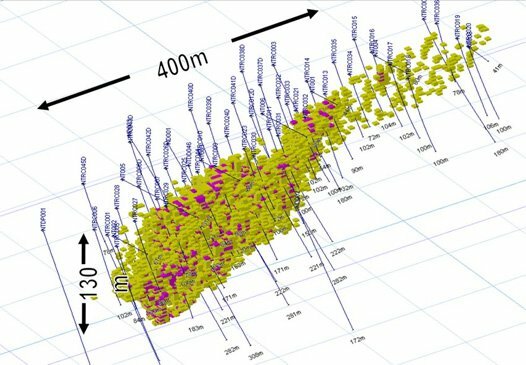 One other factor working in BGS’ favour is that a recent 3 tonne bulk sample was evaluated for screen sizing, heavy media separation and flotation – these results came back showing high-grade 6.7% lithium concentrate, a strong first result where lithium carbonate producers typically look for grades around 6%. The tests also found a 84.7% lithium recovery rate and 31.5% high mass yield – yet more signs that BGS could well have landed itself a strong lithium asset by world standards. Could lithium become one of the most sought after commodities in recent times? 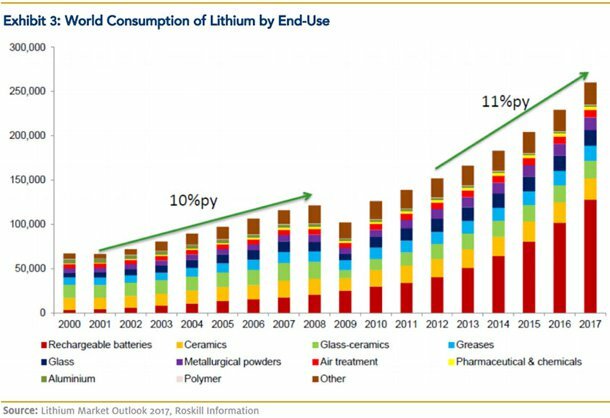 There is a chance, as the expected increase in lithium demand far outweighs its current supply. Tesla alone will need around 25,000 tonnes of lithium hydroxide per year when its gigafactory reaches peak capacity in around 2020. At current production levels, that is a whopping 45% of global supply. However – commodity prices are notoriously unstable – so there is never a guarantee that this run can continue. The sharp increase is being largely attributed to the growing demand for lithium-ion batteries and energy storage solutions that utilise lithium. Tesla’s PowerWall launched last year is a case in point. If Tesla’s competitors such as LG Chem, Foxconn, BYO and Boston Power get their own factories going, that its likely to further reduce available lithium supply and could raise prices further. LG Chem last year completed construction of an electric-vehicle battery plant in Nanjing, China, with capacity to supply batteries for 50,000 high-performance electric cars annually. Meanwhile Panasonic and Boston-Power have recently expanded operations in China to produce more battery capacity for the Asian markets. China alone expects to have 5 million electric cars on its streets by 2020, and that will require an immense amount of lithium among many other key elements including graphite and cobalt. ...but it also has another metal up its sleeve of a rather more precious variety. Lithium is primarily an industrial metal used in batteries and other manufactured goods, whereas gold is a precious metal used for jewellery and a store of value. Having both in its arsenal raises BGS’ chances of weathering the commodities downturn and raising its valuation. Now, let’s take a look at BGS’ gold portfolio to see what the yellow metal could offer this ASX explorer. Massigui is a 754 km 2 land holding with over 35,000m of drilling already completed by BGS. The combined Target Potential across all of Massigui’s deposits is 8Mt @ 1.5g/t Au for 400,000oz Au. All deposits are open at depth with additional deeper drilling expected to add further to the 8Mt currently estimated. And the great news is that the Morila Gold mine and underutilised gold processing plant are located less than 25km away from BGS’ gold deposits. This fits in nicely with keeping operating costs low and margins as wide as possible. Morila has historic production of over 6Moz since 2000, putting through around 4 million tonnes per year. BGS will almost certainly be able to offload all the gold it extracts, and with gold prices starting to see some love from investors escaping the clutches of negative interest rates and central bank printing presses, BGS’s gold assets are well positioned. BGS’s gold projects are being developed according to where there is most potential for bulk high-grade gold. And the best prospect identified so far is the Ntiola Deposit which forms part of the Massigui project. As you can see, gold has been intercepted by all drill holes at fairly high grades. BGS has done what only a handful of other opportunistic and market savvy explorers have – reach out into lithium at a time when its supply is sagging while its demand is peaking. 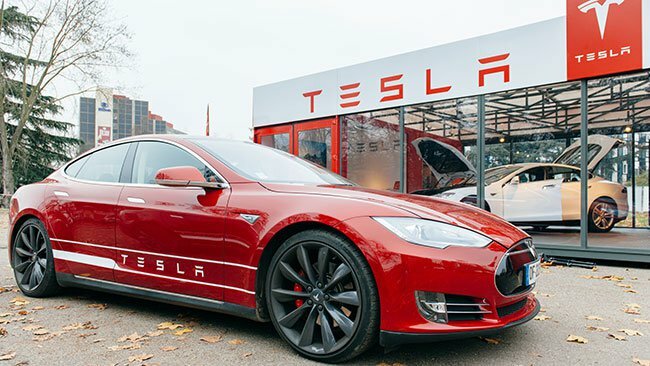 Tesla’s aggressive business model and cutting-edge battery technology appears to have cracked the code of marketing electric cars to the mainstream public, and this will soon lead to other EV car manufacturers blowing gaskets in their determination to get into the EV space. With a high-grade lithium asset secured and fervent exploration on the horizon, BGS could be dropping catalysts like fairy-tale breadcrumbs as it receives drilling/assay results and offtake deals become more likely. At the same time, investor caution is advised – and it’s always a good idea to seek professional advice before investing in a stock like BGS. Over $3MN in exploration funding has been secured and will be utilised to advance its newly flag shipped Bougouni Lithium Project over the coming months including a Scoping Study to be delivered by the end of the year. With one foot in lithium and another in gold, BGS has formulated a compelling and complimentary metals play that’s exposed to both an energy storage revolution whilst remaining rooted in a safe haven of gold.